LONG BEACH, Wash. – August 2017 – New this year, the Buffalo Kite Project will exhibit kites created by some of the nation’s most highly regarded Native American artists during the Washington State International Kite Festival. The ever-popular festival takes place in Long Beach from August 21 through 27. Representing nine Native Nations, Buffalo kites will be flown on Aug. 23, 24 and 25. The entire collection of 14 large, beautiful kites will be displayed from 11AM to 5PM on each of those days. The exhibit will be on a section of beach adjacent to the Long Beach boardwalk. Native Nations represented are Salish Kootenai, Crow, Northern Cheyenne, Cherokee, Sioux, Caddo, Oglala Lakota, Metis, and Navajo. 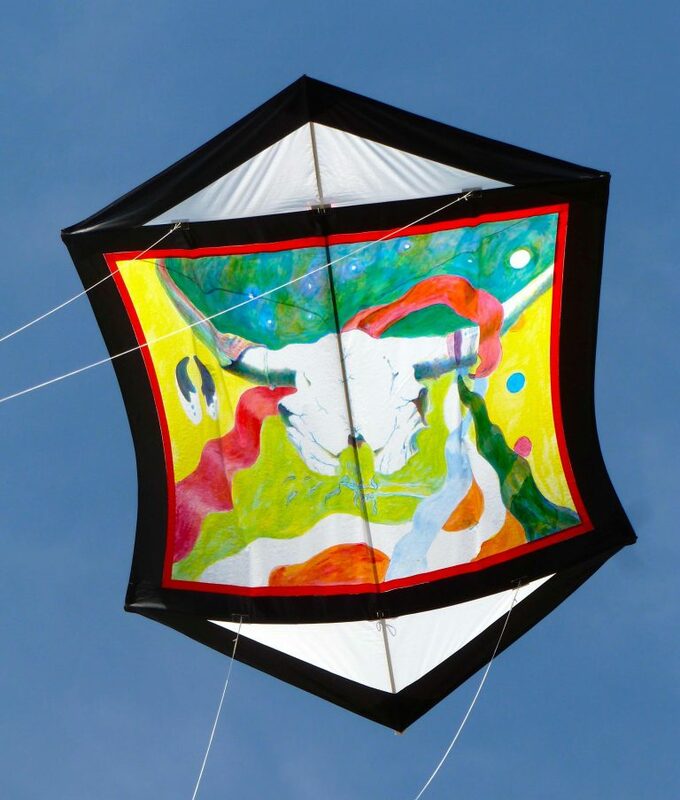 The Buffalo Kite Project, which started in 2013, was conceived to highlight the historical importance of the buffalo, buffalo jumps and First Nations art. It is ongoing and always adding new kites. Growing up around people from many native nations, Terry Lee Zee wanted to create a kite exhibit featuring native art since she got involved with kites in 1999. In 2011, she started commissioning Native American artists to paint canvases reflecting the buffalo culture, and Drake Smith started making the art fly. The pair has been taking the collection to buffalo jumps around the West for five years, establishing kite festivals at each location. This is their first appearance at the Long Beach kite festival. The biggest and most colorful event of the year on the Long Beach Peninsula, this ever-popular festival promises whimsical, artistic and dramatic displays, as well as playful and awe-inspiring competitions. Named in 2012 by Brand USA as one of the top 100 festivals in the nation, the festival began as a humble gathering of nine participants and one kite team and has grown into one of the largest kite festivals in North America, attracting thousands of visitors who share a passion for kites and kite flying. The first kite festival took place in 1981. By 1983, the festival began attracting an international audience with flyers from Japan and has since hosted flyers from Australia, Italy, Great Britain, Indonesia, New Zealand, India, France, Germany, The Netherlands, Brazil, China, and other far-reaching places. For detailed Kite Festival events and a full schedule of activities, please access www.kitefestival.com. For visitor information, please call the Long Beach Peninsula Visitors Bureau at 360.642.2400 or accesswww.visitlongbeachpeninsula.com.